› Author Affiliations Funding The study was supported by grants from the Swiss Homeopathy Association and the PanMedion Foundation, Switzerland. Background The randomised controlled trial (RCT) is considered the ‘gold standard’ for establishing treatment efficacy or effectiveness of an intervention, but its data do not infer response in an individual patient. Individualised clinical care, a fundamental principle in complementary and alternative medicine (CAM), including homeopathy, seems well disposed in principle to being researched by single-patient (N-of-1) study design. Guidelines for reporting N-of-1 trials have recently been developed. Objective To overview the current status in the literature of the N-of-1 method and its application in medicine, including CAM. To consider whether the N-of-1 trial design offers an opportunity for novel research in homeopathy. N-of-1 Trial Design The N-of-1 trial applies the principles of the conventional crossover, blinded, RCT design. The treatment under study and the comparator are repeated in a randomised order, and with suitable washout time, over a defined period. N-of-1 design is constrained for use in chronic stable conditions, and for interventions that have quick onset and cessation of effect, with modest or negligible carryover. Outcome data can be aggregated and interpreted for the individual subject; they can also be pooled with data from several similar N-of-1 trials, enabling more generalisable conclusions. The N-of-1 Trial in CAM The typical individualisation of patient care can be accommodated in N-of-1 study design if the patient and the specific therapeutic intervention are selected within the constraints of the method. Application of the N-of-1 method in CAM has been advocated but has been mainly limited, in practice, to a small number of studies in herbal and traditional Chinese medicine. The N-of-1 Trial in Homeopathy Individualised homeopathy can be accommodated for investigation within the same methodological constraints; less in-depth homeopathic approaches to prescribing are also amendable to investigation using the N-of-1 method. No such studies have been published. We identify three main targets in its ready applicability to homeopathy: (1) to optimise clinical care in an individual patient; (2) to investigate whether the outcomes of treatment using homeopathy differ from those of placebo; (3) to aggregate data from a series of N-of-1 trials to enable broader conclusions about a group of patients or intervention. 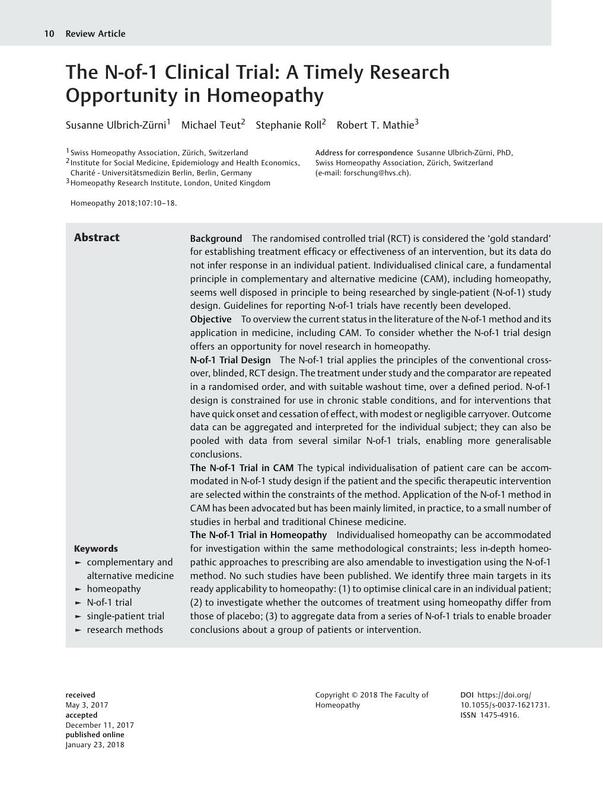 Conclusion The N-of-1 trial design offers important new investigative possibilities in homeopathy and should be explored as a means to optimise individualised health care or investigate effectiveness of the homeopathic intervention compared with placebo in individual subjects. S.U.Z. and R.T.M. co-developed the original concept. S.U.Z. devised the manuscript and led its writing. Each author has provided edited content and has approved the final manuscript. 54 Lee S, Lim N, Choi SM, Kim S. Validation study of Kim's sham needle by measuring facial temperature: an N-of-1 randomized double-blind placebo-controlled clinical trial. Evid Based Complement Alternat Med 2012; DOI: 10.1155/2012/507937. 55 Yuhong H, Qian L, Yu L. , et al. An N-of-1 trial service in clinical practice: testing the effectiveness of Liuwei Dihuang decoction for kidney-Yin deficiency syndrome. Evid Based Complement Alternat Med 2013; DOI: 10.1155/2013/827915. 56 Huang H, Yang P, Xue J. , et al. Evaluating the individualized treatment of traditional Chinese medicine: a pilot study of N-of-1 trials. Evid Based Complement Alternat Med 2014; DOI: 10.1155/2014/148730.